Review your pay stub for your gross income and take-home pay. Your take-home pay is your wages after subtracting applicable deductions from your gross income. This process is not as easy as it sounds, as your take-home pay depends on the type of deductions you have and the required calculation. Taxable wages are your earnings subject to taxation. The federal and applicable state and local governments allow you specific tax exemptions if you have pretax deductions and nontaxable wages. Pretax deductions and nontaxable wages are taken out of your gross pay before taxes are withheld. Pretax deductions include qualified retirement contributions, health and life insurance, health savings accounts and dependent care assistance. Nontaxable wages include qualified business expenses, such as meal and lodging reimbursements, offered under an IRS-qualified plan. Pretax deductions and nontaxable wages often have limitations. For example, one benefit might be excluded from a specific tax, yet another might be subjected. Consult your human resources or payroll department for clarification on your pretax deductions and nontaxable wages. After you determine what’s not taxable, subtract the nontaxable items from your gross income before calculating the tax from which it is excluded. If you do not have any pretax deductions or nontaxable wages, all of your gross income is subject to taxation. Since tax withholding is based on taxable wages, subtract payroll taxes from your taxable wages. Determine federal income tax according to the filing status and allowances you put on your W-4 form. Use the IRS Circular E tax table that matches your W-4 data and wages and pay period to figure your withholding amount. Calculate Social Security tax at 4.2 percent of your taxable wages up to $110,100 for the year, and Medicare tax at 1.45 percent of all your taxable wages, as of 2012. You can find employee federal tax rates in the Circular E. If applicable, consult the state taxation agency for your state and local income tax withholding rates. A few states also require that employees pay state unemployment tax and state disability insurance. In these cases, apply the respective administering agency’s calculation method. After-tax deductions and taxable benefits are included in your wages when taxes are calculated. They include wage garnishment, and voluntary deductions, such as health insurance and retirement contributions, that are not offered to you on a pretax basis. Taxable benefits include travel, meal and lodging reimbursements that are not offered under an IRS-qualified plan. 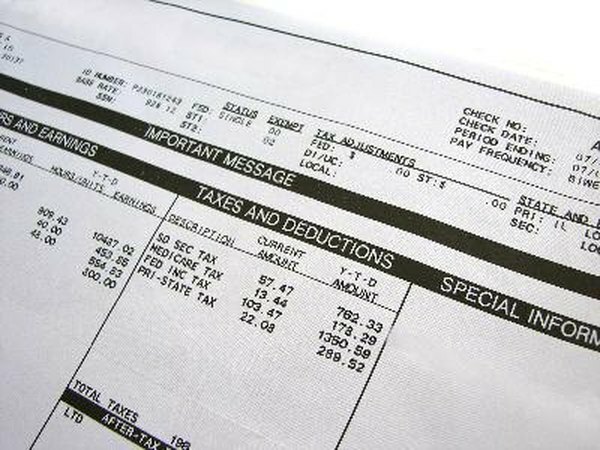 If you have no voluntary pretax or after-tax deductions, your take-home pay is simply your gross wages after mandatory deductions, such as taxes and wage garnishment. Internal Revenue Service: Is an Employee’s Reimbursement for Business Travel ever Taxable? Does Hours Worked Affect Withholding Tax?